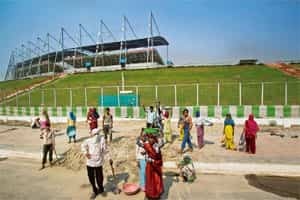 New Delhi: India’s first Formula One (F1) Grand Prix has its fans even in the villages not so close to Greater Noida’s state-of-the-art Buddh International Circuit (BIC), spread across 875 acres in what’s usually regarded as Noida’s nearby quiet neighbour. They include farmers like Manoj who have found gainful employment at the site. As a private security guard at Jaypee Sports International Ltd’s BIC, Manoj has earned Rs10,000 in the two months he’s been employed, better than what he used to make from his farm in Ghaziabad. The F1 event has meant assured daily wages for Kiran, who is in her mid-50s, and her daughters Manju (17) and Kamal (15). They have been planting grass on the verge lining the Yamuna Expressway, which connects BIC and Jaypee Sports City, for almost two years now. “This is a regular income unlike in the village," she said. “My younger daughter dropped out of school to earn and help me support the family. We will work here for as long as we can and then go back to the village." They travel to the expressway along with many other labourers from their village by bus, working from 8am until sunset. Together, they make about Rs450 a day. The race weekend—28-30 October—is expected to generate a surge of business for companies in the hospitality, transport and other industries from the 100,000 or so spectators expected over the three days. The larger aim is to promote India as an emerging hub for motor sports and the automotive industry, besides bolstering its image as a country that can organize large international events, dispelling the negative impression associated with the conduct of the Commonwealth Games last year. The investment of Rs1,700 crore in F1 infrastructure, the development of facilities and the provision of services will create, directly and indirectly, several thousand skilled, technical and commercial jobs, said D.S. Rawat, secretary general of the Associated Chambers of Commerce and Industry of India. “Experts are also of the view that after the Indian Grand Prix kicks off, it has the potential to generate around Rs850 crore in revenue and employ as many as 10,000," he said. “Overall, the event may generate business worth around Rs10,000 crore, including hospitality, advertisements, travel, ticket revenue, etc." Taxi operators project a jump in demand for cars. Meru Cabs has advanced its booking deadline to 48 hours instead of the usual 24 to cope with the anticipated rush, said Rishi Uppal, branch head (corporate sales). “We have hired 150 drivers specifically for the Formula 1 weekend over the 1,400 cars we already have, since we expect a 10-20% increase in demand," he said. Easy Cabs expects “a 25-30% increase in business beyond the usual Diwali rush", said Sakshi Vij, head (marketing). The festival is on 26 October. Independent taxi operators like Suraj Gupta, meanwhile, are breaking with tradition by working through the Diwali week. “On an average, I earn Rs1,500 a day," he said. “During the Formula 1 weekend, I am hoping to earn at least Rs3,500-4,500." Besides renting cars and other vehicles, Jaypee has hired 1,000 buses to transport spectators to BIC in Greater Noida. “We have hired approximately 400 DTC (Delhi Transport Corporation) low-floor buses, which were used for the Commonwealth Games," said Askari Zaidi, vice-president (corporate communications), Jaypee Group. “The remaining are from private contractors." As for accommodation, most upscale hotels are booked to capacity during what is usually a lean period. “Thanks to F1, we have seen a surge in bookings. The general buzz among people is getting increasingly feverish," said Taljinder Singh, general manager, Taj Palace Hotel, New Delhi, about 60km from BIC. Room rents at luxury hotels are about double the usual rates. “This is just the first year and all the hotels are booked, considering the fact that this is Diwali time when domestic tourism is at a low," said P.R. Srinivas, India head for hospitality at Deloitte Touche Tohmatsu India Pvt. Ltd.
Spectators will have to pass through various levels of security. Jaypee has deployed approximately 400 security personnel and it plans to hire another 1,500 guards from private agencies such as G4S and Security and Intelligence Services (India) Ltd. Another 70 men in blue uniforms will act as bouncers to rein in boisterous behaviour among the crowds. One of them, Suraj Sharma, is getting paid Rs12,000 a month. He’s one among the several men who were left jobless after their families sold the land on which BIC is built. “Where we work now was all our land," he said. “In our village, there is neither any work nor any farmland left. So we came here. We earn enough money and the food is free, though we don’t know what we will do after the event is over." For many of those who have benefited from F1 coming to Greater Noida, the event will necessarily have only a short-term impact. “This kind of sporting event attracts a lot of foreign participants. Employment is being generated, but it happens only periodically," said Rajiv Kumar, secretary general, Federation of Indian Chambers of Commerce and Industry. “It’s not as if the same can be sustained." As the engines cool down and the smell of burning rubber begins to fade, people like Manoj, Kiran and Suraj may not have jobs to come back to on the Monday after the race. “We have no plans after the races are over. Just like we got this job, we will head out in search for another," Manoj said.